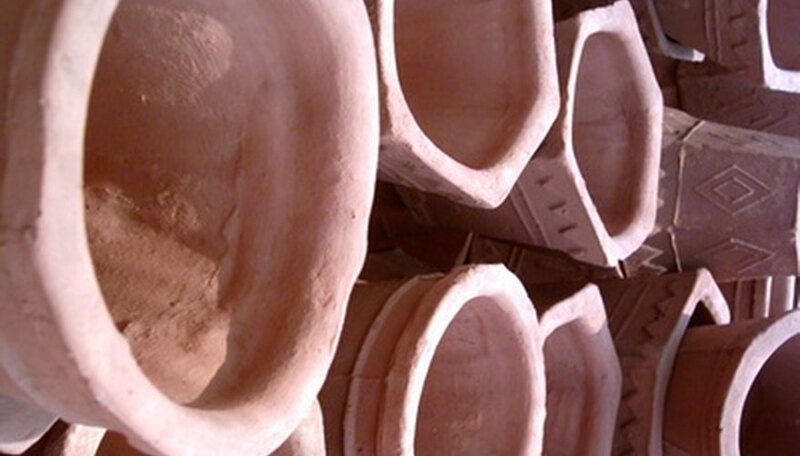 Plaster of Paris is a type of crafting plaster that you can shape into just about anything. The secret to a successful plaster of Paris project is to lubricate the mold so that the finished project will release easily. You can make plaster of Paris flower pots with two similar molds as long as one fits inside the other. The sides of the flower pot form in the space between the two molds. Plaster of Paris molds are available at craft and discount stores, or you can make your own with common household objects. Clean the inside of a large coffee can. Remove the paper or plastic advertising and clean the outside of a small coffee can. Hammer five 2-inch nails into the base of the medium size coffee can. Place one nail in the center. Surround it with the remaining four nails in a circle between 1 and 2 inches from the center nail. Leave the nails extending at least 1 1/2 inches from the base of the can. Spread petroleum jelly on the inside of the large coffee can. Spread petroleum jelly on the outside of the medium coffee can. Spread petroleum jelly on the extended portion of the nails. Mix the plaster of Paris in a plastic bucket according to the manufacturer’s directions. The consistency should be that of a malt or thick shake. Pour the plaster of Paris mixture into the bottom of the large coffee can to create a 1 1/2-inch base. Insert the medium coffee can, nails down, into the center of the large coffee can. Press the can down so the nail heads touch the base of the large coffee can. The nails will make the drainage holes for the flower pot. Pour or spoon plaster of Paris between the sides of the two coffee cans. Pick up the large coffee can and drop it several times to release any air bubbles. Let the plaster harden for at least one hour, then remove the medium coffee can. Remove the flower pot from the large coffee can. If you have trouble removing it, cut slits in the side of the can with a craft knife to peel the can from the flower pot. Allow the flower pot to dry for 24 hours. Decorate the flower pot inside and out with acrylic paint. Finish the flower pot by spraying it with polyurethane spray. Pour plaster of Paris into small plastic molds to create medallions for the flower pots. Remember to lubricate the molds before you add the plaster. Glue the medallions to the outside of the flower pot with waterproof construction adhesive.